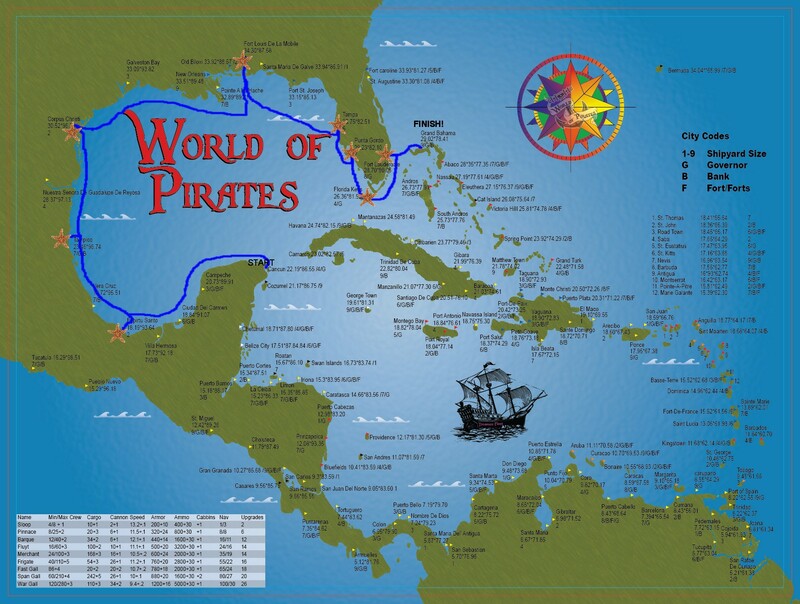 World of Pirates » Blog Archive » March Madness PVP Race! Sunday March 30th at 2:45 m EDT / 20:45 Germany. You wont want to miss this! It’s the first time we’ve ever offered a PVP race! Each entrant must purchase a six pack of Battle Barques in the store but they are very cheap just for this event. You are not allowed to sail more then six (6) ships. You will own these ships so there is no need to give them back to us. Yes, you can repair! You can pick up all the W&C you want but it will reduce the amount of luxuries you can carry… If you don’t have enough to repair you can be rafted. If you don’t have enough food you’ll end up on a raft too; so how many luxuries you deliver to Grand Bahama will be your strategic choice. You must follow the route; the cities you must stop in are marked with a star fish. You must turn over your luxuries to a green staff member in Grand Bahama. To win you have to have the largest number of luxuries. The three entrants with the highest number of luxuries will be the winners! This is not a timed race so speed isn’t a priority however everyone must start at the same time. READ the “fine print” for rules in case of a tie. Clan members; you should leave your clan so you can fight against the members. Clan leaders; we can put you back into your clan as clan leader after the race; please allow us a few hours to complete the necessary work. 1st place; a set of six battle barques and $25 in PoE to spend in the store. 2nd place; a set of six battle barques and $15.00 in PoE to spend in the store. 3rd place; a set of six battle barques. In the case of a tie; two or more players arriving in Grand Bahama with the same number of luxuries. The winner will be determined by the time he arrived, 1st player to arrive with the same number of luxuries as player C, D, E will be the 1st place winner; second place will go to the player who arrived second, etc.